Looking for graphing activities that kids of any skill level can do? 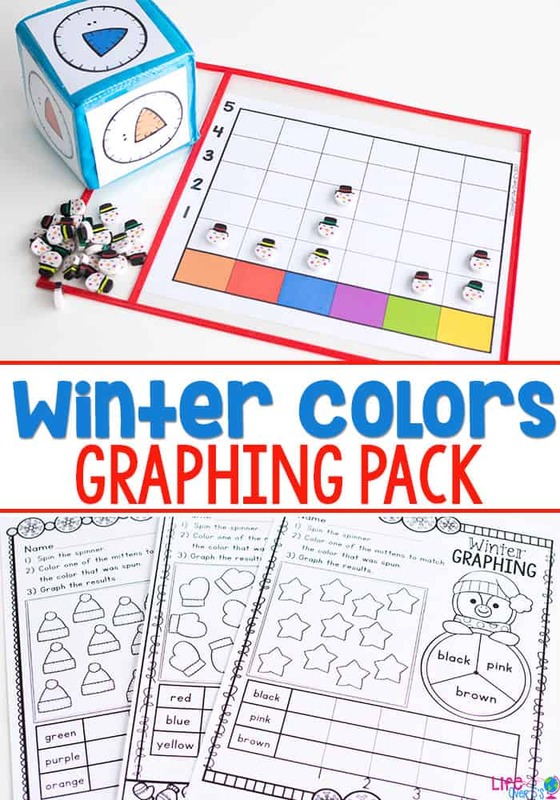 These winter color graphing activities for preschoolers are perfect! Kids can work on their color recognition skills while working on math skills like counting, graphing and analytical skills like comparing numbers and results. 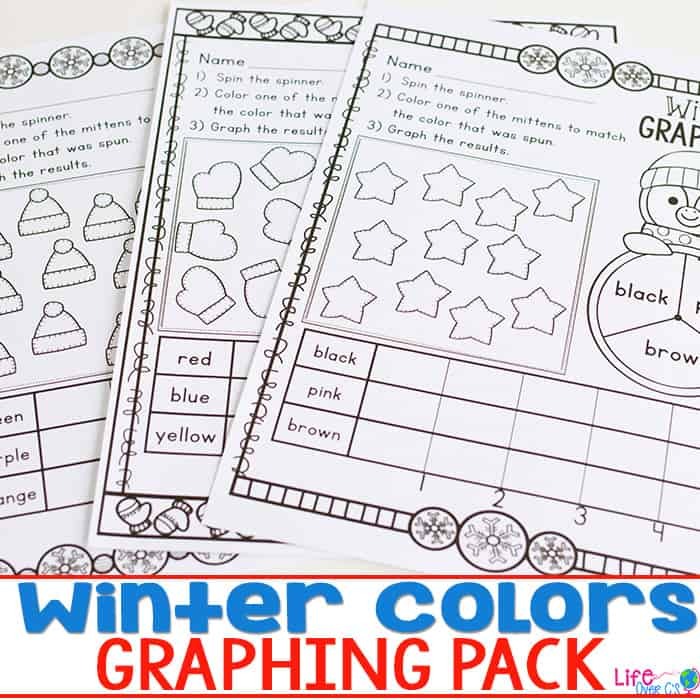 Use the whole class winter color graphing set to graph snowmen during circle time, use the winter spin, color & graph printables for morning work or independent math practice and use the winter roll & graph sets for math centers. Black & white graphing sets are also included (winter hats and snowmen) for those who have limited printing abilities. Simply color the cubes and graphs to represent the colors you want to focus on. 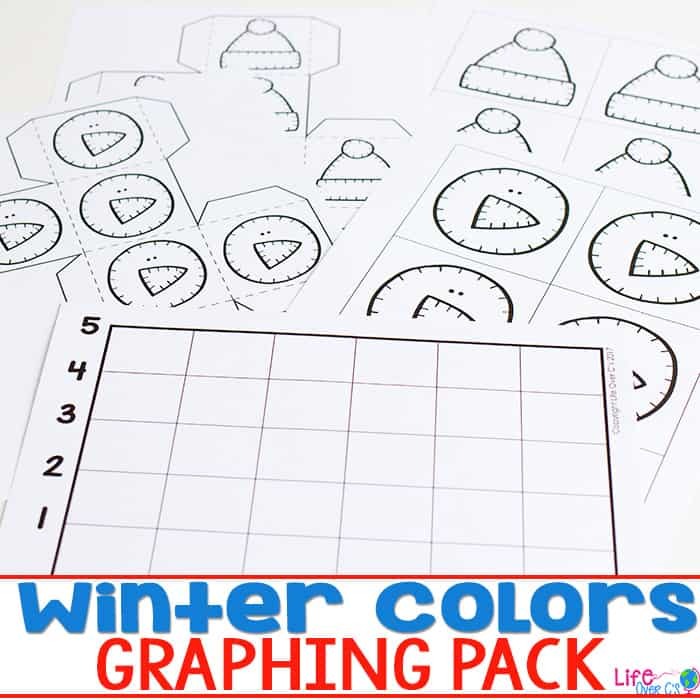 What’s Included in the Winter Colors Preschool Graphing Set? Choose from differentiated instruction cube inserts or create a cube from the included template to create your die. Then roll the die and place a marker on the column with the matching color. Continue rolling the snowman die until one color reaches the top of the graph. Two graph options are included (count to 5 and count to 10, so that you can easily differentiate based on the counting skills and attention span of your students. 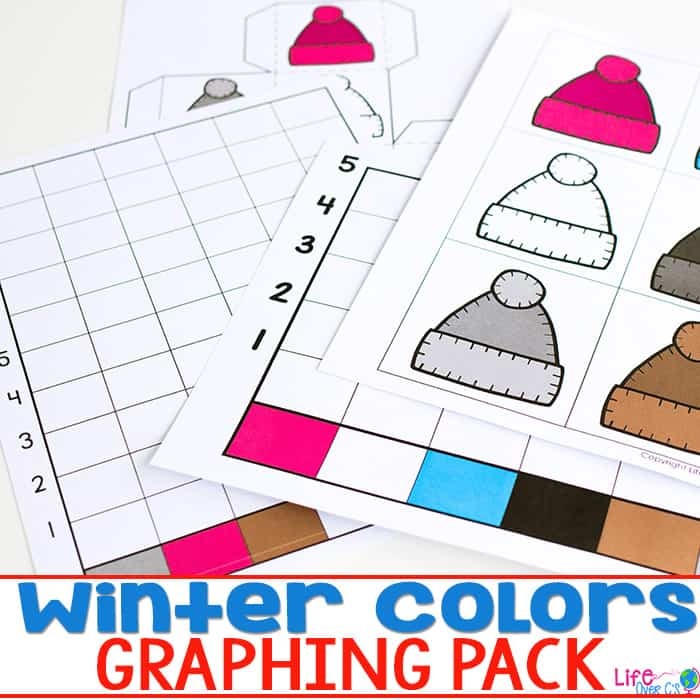 Set up is identical to the snowman Roll & Graph Set, but the Winter Hat Roll & Graph Set provides different colors, so that kids can continue working on their graphing skills without repeating the same, exact math activity. Both the snowman and winter hat sets are included in black & white for those who have limited color printing abilities and those who would like to choose their own color combinations. Use these easy prep Spin, Color & Graph printables for a morning activity or for a quick, independent activity. 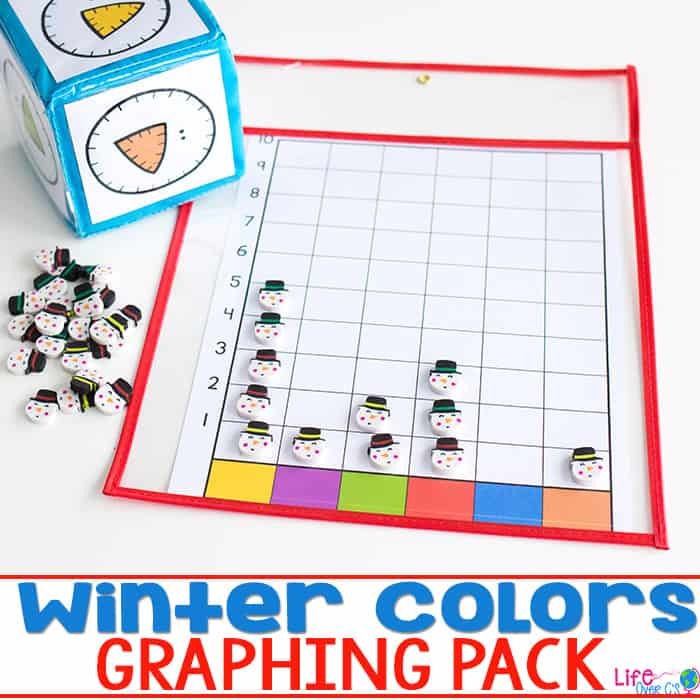 Get the whole class involved in graphing during circle time with this fun snowman graphing set. Graph the images in a pocket chart, on the floor or even attach magnets to the back to use on a white board. These 5 Winter Color Graphing activities for preschoolers make great math centers for your pre-k or preschool classroom. Print and laminate the graphing activities for low-prep, hands-on learning. -Choose a cube format. The large winter images can be used with a differentiated instruction cube to create a large die or you can use the cube template to form your own cube if you do not have the differentiated instruction cubes. -Want to work on different colors with your preschoolers? No problem! Just use the black & white graphing set and color the cube templates and graphs to match the colors you wish to focus on. -Need a quick morning work activity, but don’t want a boring worksheet? Use the print & go Spin, Color & Graph preschool printables for a fun, independent morning activity. – Use the Whole Class Graphing Activity during circle time for a great way to introduce colors and graphing to your preschoolers. -The roll and graph sets are great to use with special needs students as they do not require any reading skills and are the perfect way to repeat color words without frustrating the child with flash cards. More Preschool Printables You’ll Love!